Your gift bag should represent the kind of present you're giving. 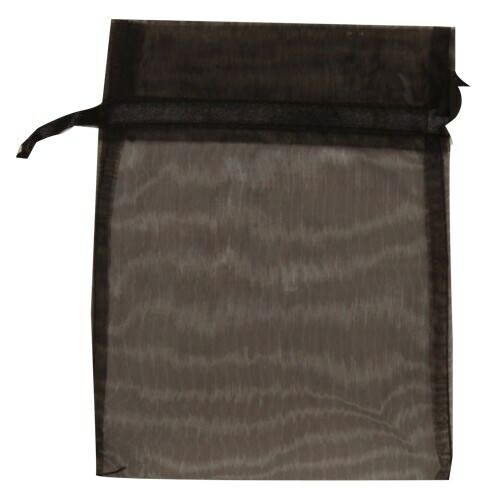 And with these Black Sheer Organza Bags, you'll be representing style and class, mystery and sophistication. The sheer organza material makes your present extra fancy and extra special. Whether you want to cover your gifts or decorate your party favors, these versatile bags will definitely bring elegance into any occasion. With our variety of sizes you'll be able to perfectly fit all kinds of gifts in all kind of sizes. From small jewelry to candies, from candles to wine bottles, you'll be able to find the right size for you. And all of these bags come with drawstrings that tighten by by simply pulling them outward. Easy and beautiful packaging for all of your occasions, what more can you ask for?